University of Wisconsin Press, 9780299291549, 352pp. Go beyond bird feeders! Learn how to create outstanding bird habitats in your own yard with native plants that offer food, cover, and nesting sites for birds. This guide is packed with color photographs, sage advice, detailed instructions, and garden plans. It features nine different habitat gardens for hummingbirds, bluebirds, wintering birds, migrant birds, and birds that frequent prairies, wetlands, lakes, shrublands, and woodlands, along with advice about maintaining your plantings and augmenting them with nest boxes, birdbaths, misters, and perches. The information on recommended plant species includes their native ranges in Illinois, Indiana, Iowa, Ohio, Michigan, Minnesota, Missouri, and Wisconsin; the birds they attract; their visual characteristics; and their cultivation. Mariette Nowak also describes how gardeners featured in this book have gone beyond their own garden gates to work for the protection and restoration of bird habitat in their neighborhoods and communities. 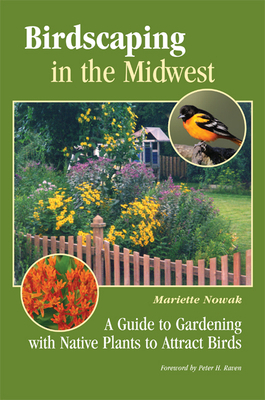 Birdscaping in the Midwest provides many sources of further information, including publications, websites, organizations, and native plant nurseries. Mariette Nowak is an active leader and volunteer for Wild Ones: Native Plants, Natural Landscapes and Lakeland Audubon Society. She is also a public speaker on landscaping, native plants, and birding. Before her retirement, she was director of the Wehr Nature Center, a unit of the Milwaukee County Parks in Wisconsin.